ADP is a go-to payroll software company used by many of the most successful businesses in the world. They offer easy payroll, HR software and payroll tax services. ADP prides itself on taking the middle man out of fthe payroll process by offering compliance services for you, your employees and your clients during the payroll process. They pride themselves on allowing small business owners to focus on their small businesses and vision, not the smalls stuff. For 10 employees with a by-weekly payroll, ADP is about $3,000. Pros: ADP offers retirement plan initiatives, state-of-the-art technology and a workforce management solution that is easy to use. RUN powered by ADP is also now available as an app. They have 24/7 reps available, webinars, in person training, 401(k) tracking, attendance management, deductions management, check printing, direct deposit, W-2 preparation, tax management and much more incentives available. Cons: Some users say ADP is not adapting to its environment as quickly as some other payroll companies and that in trying to match payroll and HR, it feels they are a bit behind the cusp, although it is in their pipeline to work on. Namely has become an increasingly popular go-to company for small businesess to mid-sized businesses. Their technology is state of the art and they are able to handle HR, Payroll, Benefits, training for documentation, webinars and live in person. The company was founded in 2012 and the amount of features they offer is comparable with any older companies: 401(k) tracking, self-service portal, tax management, W2 preparation, Direct Deposit, compensation management, check printing, attendance management and more. They charge $12 per month per employee for the basic service without payroll. Payroll, benefits, administration fees and add-ons are on a per-client basis. Pros: The software is an easy-to-use interface and many say it is an improvement to ADP as a cloud-based payroll software option. It is one of the fastest payroll systems on the market. They are always upgrading their technology and working to provide their clients with the best service possible. Cons: Being that Namely was created in the last 5 years, the technology is new and the foudner and support team are technically learning with their clients, you. The upside is that they will listen to your complaints and try to improve them; the downside is that you will most likely have some complaints as the product is newer. Gusto is a great company at a very affordable rate of $1088 per year. The first month with the service is free. Gusto offers an easy setup with automated tax filings and award-winning customer service. They offer payroll, benefit, 401(k), workers compensation and HR support. They will also file your payroll taxes too. 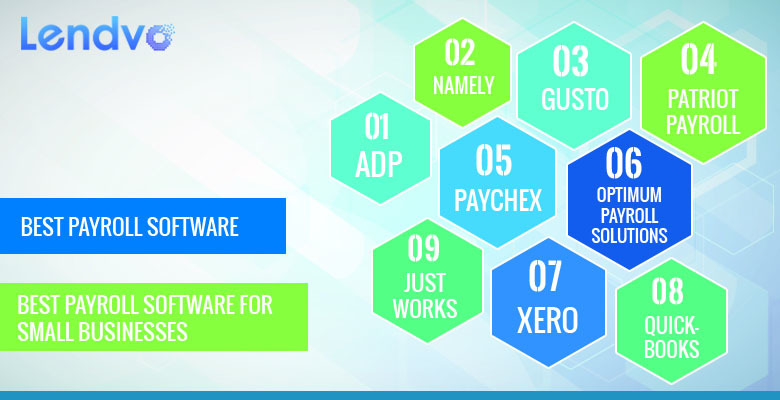 Intuit and Xero marketplace members have rated Gusto to be the #1 payroll app. Pros: Gusto is extremely afforable in comparison to Namely, ADP and many of the other apps available to small business owners for payroll software support. You can print your own checks with Gusto. Self service portal is easy to use. Reminders are provided through the site of what needs to be done. Pricing is simple: $39 up front + $6/employee per month. Cons: Support is only available by phone and email support from Monday to Friday, 9am – 8pm EST. While it is not available as much as some other companies, their support is among themost highly rated when compared to other companies. Labor posters are unavailable directly through Gusto. No compensation or attendance management offered. Paychex, or Paychex Flex, is a highly rated payroll company with great customer service. They offer assistance in tax management, benefits management, compensation management, deductions management, direct deposit, vacation / leave tracking and have a 24/7 support team. They offer training via webinars, documentation and in person. Paychex Flex software platfoorm has a user-friendly interface and is available on Cloud, Saas and Web. It can quickly generate quick receipts, feedback, current payroll and last payroll. It also stores employee data, participant and plan balances along with retirement services for employers on the home screen of your personal business profile. Payxhex costs about $3350 per year plus or minus certain fees. Pros: Paychex offers simples solutions for running your payroll while incorporating all the newest tax rates and reculatory information into its interfact. Employee data, administration, document and reports, tools and reminders are all easily accessible through the app. Most cusotomers say the program is easy to use. Cons: Some customers say the payroll service support depends on the payroll specialist; this could be frustrating at times to have to send more than one request to have something taken care of. Others complain they sometimes have trouble logging in and it can be inefficient. Patriot Payroll Software offers several levels of payroll services to handle payroll tax filings, deal with direct deposit, print paychecks, offer 401(k) tracking, attendance management, deductions management, compensation management, W2 preparation, vacation / leave tracking and wage garnishment. This can all be done on the very user friendly interface for as low as $10 per month for their most simple plan. Setup is self-explanatory and Patriot even offers to help you along the way. Pros: Customer service is supposed to be very friendl ywhen issues arise. Prices are extremely affordable in comparison to other companies for the wide variety of services that Patriot offers to its customers. Cons: Some members have complained that setup can take a while at the beginning. Calendar setup and lack of reminders has been another complaint. Again, complaints about the portal seem to be the most common. The payroll report does not break down hourly employees from employees on salary. JustWorks serves the purpose of working as a payroll software system as well as a HR software hub for small business owners. JustWorks prides itself on its PEO model which allows it to put all of its customers information in an interface to manage benefits, health insurance and tax filings. The starting price is $79 per month per user. Services offered include 401(k) tracking, benefits management, compensation management, deductions management, Direct Deposit, tax management, W2 preparation, wage garnishment, vacation / leave tracking, all available through its self-service portal. JustWorks also helps small businesses to find and get better rates for vision, dental and medical insurance. Vendors and contractors are payable through the website and reports are available at any time. Pros: Team members can be given permissions to access differenct functionalities within the system. Accountants can take care of expense reimbursements and time-off requets online while the higher-ups in your company can select benefits. The medical, vision and dental benefits JustWorks is capable of getting can really help to offset the moderately higher monthly costs. Calendar provided to keep track of everything. Cons: The $79.00 rate is a bit higher than some of the other companies mentioned. The company was founded in 2013 so they are a bit newer and there will be some kinks, yet they have been reviewed by all of the top business magazine and are used by some of the top businesses in the states. Xero is a one-stop shop for payroll management that offers check printing, compensation management, Direct Deposit, tax management, vacation / leave tracking, W2 preparation and a self service portal to deal with all your tax and HR needs. Payroll management, leave management and time sheets are also available to employers and employees on the software. Xero’s pricing is $30 per month. They offer training on documentation, webinars, live online training as well as in person. Support is available online. With the free trail and once you pay, you xan use Xero on the cloud, SaaS or on the web. For mobile, it is available on Android and iOS Native. Pros: The personal administration page for employees is easy to manage. It is easy to use on mobile and the web interface is easy to navigate. The accounting process has received positive reviews from employers and employees using the program. Cons: Xero is only now available in a handful of states, but should soon be coming to more as the program gets more and more population. Xero is said to be difficult to use my some users, but once they learn it more, it becomes more usable. QuickBooks is one of the best known financial and accounting applications in the industry. They have done a great job in transforming the way accounting is done and there is goo dreasoning for choosing them as your payroll software system. The interface of QuickBooks does a great job in allowing its customers, whether they be employees or employers, to manage all of their accounting in one place including W2 preparation, check printing, compensation management, Direct Deposit and other financial management needs on a user-friendly multi-slate interface. QuickBooks allows you to create invoices, estimate taxes, send checks and receive payments all in one place. Pros: QuickBooks is a reputable one-stop-shop for managing all of your financial needs whether you have an employee base of 1-10 people or 80-100. The impeccable customer service QuickBooks offers allows small business owners to take care of the vision and creative independence of their company by knowing their employees are taken care of. Plans start at as low as $10 per month. Cons: QuickBooks does not offer some of the services that many other payroll software companies in the industry offer because their main focus is dealing with taxes. Being an industry standard for so long, its competition seems to finally be catching up. Optimum Payroll Solutions is one of the most highly rated payroll software companies in the industry. Their payroll application software offers a free demo and they come with a 4.5 out of 5 star rating. As a top-notch payroll software system, Optimum provides itself on its common database approach which is built internally and integrated with its in-house software. Optimum HRIS is what truly makes it an entire cost-effiective solution for HRIS management. Services available from Optimum are W2 preparation, wage garnishment, vacation and leave tracking, tax management, Direct Deposit, deductions management, check printing, benefits managemnt, attendance management and an easy to approach staff handling the software to deal with any problems that occur along the way. Optimum offers a free demo and can be used within the cloud, SaaS, web and Windows platforms. The starting price is a one time fee of $10,000. Pros: Optimum payroll solutions has been a user-friendly software company for several years now and allows users to create additional reports using excel. The interface is payroll friendly and the customer support team is generally very responsive when responding to emails and phone calls that cusomters have. Cons: New reports are sometimes including within Optimum payroll solutions’ updates without the user knowing that new reports are being generated. Some of the issues within the system occur from cash-outs and hours being cashed in on when they are generated on the weekends because the developers created the system only thinking work days would be those during the week. Undoubtedly, Optimum HRIS will resolve this problem in the coming months or years and this should not deter you from using their services. The start-up fee of $10k is extremely expensive, but the product, ease of use and customer serivce make it a worthwhile investment for the right customer.